Aegis 360 Consulting is a global provider of business and leadership coaching and staff development services that help organizations improve leadership competencies, discover and align business strategies, and improve culture through employee engagement efforts. Started in 2000 by Ned Parks under the previous name of New Directions, Aegis 360 Consulting, Inc has been re-branded but has kept the high standard of quality and integrity that has been the key driving force from the beginning. In 2006, Parks implemented a program with Costa Cruise Lines delivering supervisory training and coaching for the supervisor through the ships Captain, Hotel Director, and Ship Engineer. Then in 2010, New Directions became an authorized partner with Wiley Publishing for the Everything DiSC product line. Parks has attended Registered Corporate Coach training with Impact Training and Development and achieved the designation of Registered Corporate Coach (RCC) specializing in business coaching. Dedicated to learning and improvement no matter what stage you are in, the company partnered with Celemi International as a Certified Solutions Provider for their world renowned table top business simulations. Additionally, Parks also completed Lean 6 Sigma Green Belt training with Kent State University Center for Corporate and Professional Development. 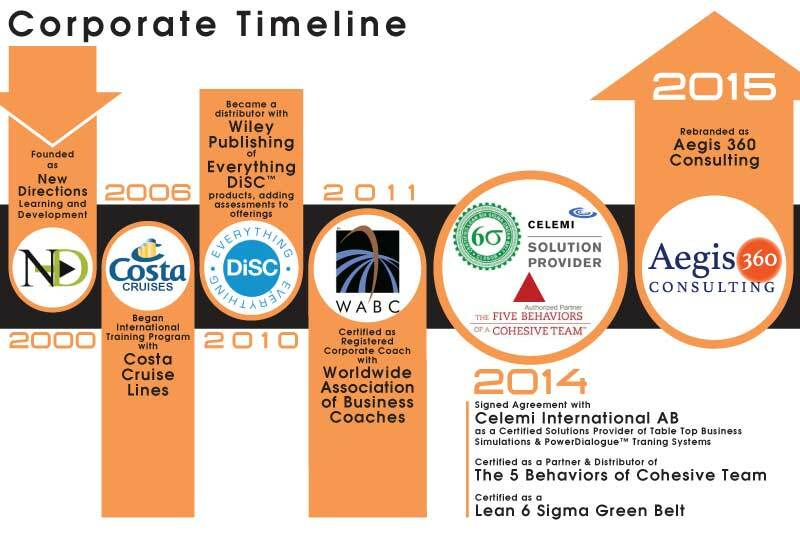 On top of all his accomplishments, Parks became certified through Wiley Publishing as a Authorized Partner for the Five Behaviors of a Cohesive Team program. The impressive background of Ned Parks and Aegis 360 shows just how dedicated, willing and passionate they are in leadership coaching and want to get the best results each time they step in. Before they even charge you, Aegis 360 will ask questions and dig to the bottom to see what your company or employees really need in order to help your business become smoothly operated with great leadership and communication. Let Ned Parks and Aegis 360 consult with you today and have your business become better tomorrow.